This is a part of my collection. I collect S.H. 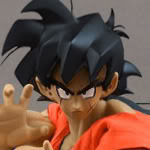 Figuarts from Dragon Ball, Ranma 1/2, Sailor Moon, Myth Cloth EX, Marvel Hot Toys and other stuff from Japan. Welcome to DBF andyjonson ! Your collection looks great! I love that you have all of the Sailor Moon characters. I've never seen them all displayed before, so that's pretty cool! Make sure to create an account on www.imgur.com and upload your pictures to an album on there and then copy the "BBcode" (see below for an example) and put that in your posts. I have to delete DBF's attachments every few weeks/months when the space gets full, so I'll unfortunately be deleting your great pictures in a few weeks/months. So please host them on IMGUR, edit your first post in this thread, and paste the IMG code for all of them in that post so they'll be online forever!